Swiss pocket watches are renowned the world over. They are an integral part of society status and have a reputation for making a stylish statement. At W.E. Clark Watch Repairs we specialise in the repair, restoration and refurbishment of all Swiss pocket watches. Swiss pocket watches are defined as such by the Swiss government as having a Swiss movement when the production is at least 60 per cent manufactured in Switzerland. The watch industry imposes a stricter parameter, with an 80 per cent minimum Swiss production cost required before labelling a pocket watch of Swiss origin. Those that are manufactured completely in Switzerland can be termed ‘Swiss made’ and are timepieces of optimum quality and mechanical excellence. While the age of many antique pocket watches can be valued by a serial number, most antique Swiss pocket watches were not given a serial number. The age of most antique Swiss pocket watches is determined by the style of the movement and the way the pocket watch is constructed. Our Master Watchmaker is an expert in the repair and restoration of all Swiss movement types and has extensive experience in identifying the age of any Swiss pocket watch. We find it a privilege to work with Swiss pocket watches. They are timepieces with movements displaying a level of mechanical engineering excellence that is difficult to match across the world. Our Master Watchmaker offers a level of service and expertise to match the exquisite nature of the Swiss timepiece. While Swiss pocket watches are renowned for their durability, over time the precision of any mechanism can fail as a result of the wear and tear of intricate parts. Our Master Watchmaker is an expert at disassembling and repairing the finely tuned movements found in antique and vintage Swiss pocket watches. We are one of a few jewellers in the UK to have our very own Master Watchmaker. We want to offer our customers a level of expertise that our competitors simply cannot match. Your antique Swiss pocket watch is in safe hands with our Master Watchmaker. Swiss pocket watch refurbishment and repair is our speciality. Whether you have an open face pocket watch or a Hunter-style pocket watch, and whatever the movement type, our Master Watchmaker has the expertise to breathe new life into your Swiss pocket watch with the same high standard as its original form. We can source replacement parts to preserve the value of your timepiece, or where that is not possible our Master Watchmaker is an expert at handcrafting intricate parts to get your Swiss pocket watch working perfectly again. We will always discuss all of the options with you before we start any repair or restoration work. Ultimately, we want your Swiss pocket watch to look its absolute best, keep its value and keep time perfectly. 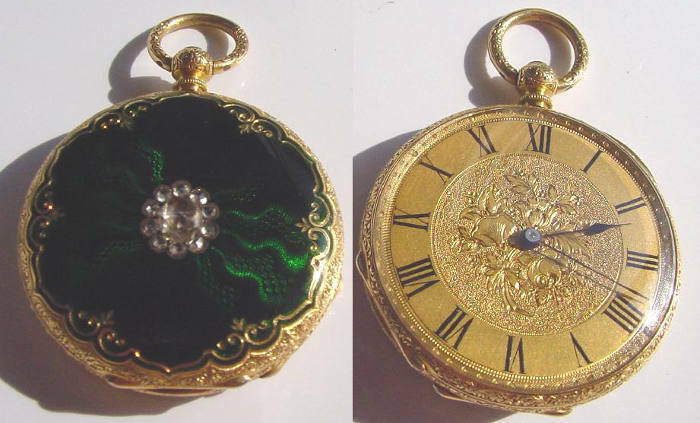 We will take care of your Swiss pocket watch from start to finish, and carry out repairs and restoration work with the utmost sensitivity and expertise. We are absolutely confident you will be delighted with the results, but for peace of mind we offer a minimum 12 month guarantee for all work undertaken. Our Swiss pocket watch service is second to none. You can ship your timepiece to us from anywhere in the UK using our Royal Mail Special Delivery FREEPOST service. Your Swiss pocket watch is insured for up to £20,000 throughout its postal journey, from the moment the package leaves your hand to when it is posted back to you. Before we commence any work, we will discuss any repairs and costs with you first. Antique Swiss pocket watch repair with W.E. Clark couldn’t be easier. We would love to repair any Swiss pocket watch from around the world. Outside of the UK you will have to organise shipping, other than that you can expect the same exceptional Swiss pocket watch repair service. Feel free to bring your Swiss timepiece into our Lewes showroom. We would love to meet you and discuss your antique or vintage Swiss pocket watch repair requirements with you.